Photo by Jenny Neyman, Redoubt Reporter. 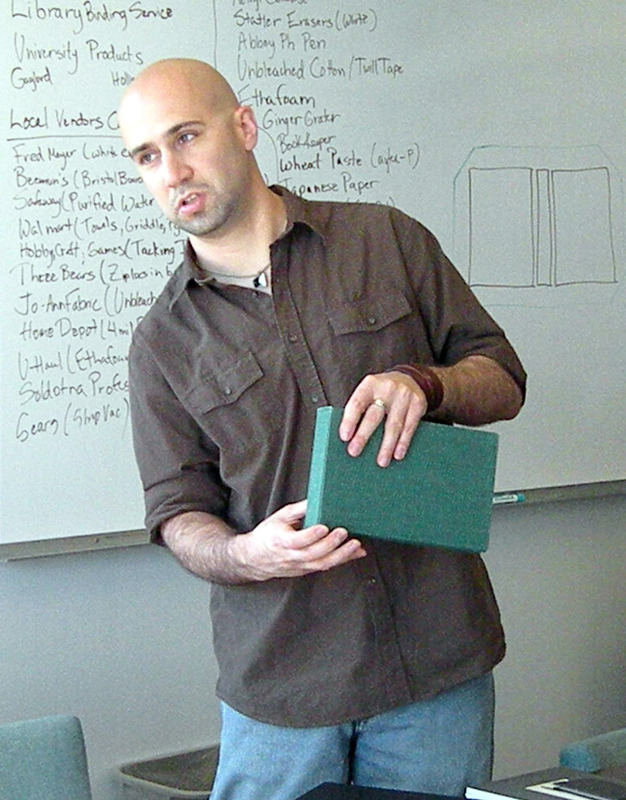 Paper conservator Seth Irwin teaches a workshop on making archival boxes at the Kenai Visitors and Cultural Center last month. Irwin is visiting museums throughout the state to repair and preserve Alaska’s massive historic paper collection. Seth Irwin didn’t write the book on caring for historic documents, but he could repair it and teach a museum how to properly preserve it. The paper conservator is making the rounds of museums throughout the state, assessing historic paper collections, repairing damaged books, documents and photos, instructing staff on proper paper conservation techniques and giving workshops for the public, made possible by a grant from the Rasmuson Foundation. It’s a massive job, and one that hasn’t been tackled before in Alaska. The conservation world has three areas of expertise — object, paintings and paper conservation. Alaska has only three object conservators, trained to repair and preserve all the state’s important “stuff” —relics, artifacts and the like from Native, Russian and early American times. There is no painting conservator in the state, so all repair and preservation work requiring a conservator’s specialized touch needs to be sent Outside. Before Irwin started his residencies at Alaska museums in March, there was no paper conservator, either. But there is plenty of paper that needs conserving. One element of his work is simply figuring out what’s at an institution and the condition of its materials. “There’s never really been a full assessment of all the paper collections in the state, so that’s part of what’s been happening is doing assessment reports for many of the museums, just so they can see what they have. It’s assessing the state of collection — this is the collection, this is how it’s stored, these are the dangers, these are the emergencies you have to deal with right now, these are the suggestions for what I would recommend you guys do,” he said. Alaska’s challenging and varied climates pose special threats to paper collections. Valdez is at risk of seismic activity. Petersburg is threatened by dampness. The Aviation Heritage Museum in Anchorage is housed in a drafty old aviation hangar, so every time the door opens the climate inside changes. Irwin said he hasn’t found any widespread, dire emergencies at the institutions he’s visited. It’s more a challenge of just training museum staff to sort through their mountains of historic records and store them properly, so they don’t become history themselves. “Most of the museums are so remote and they’re one-man shows. The problem a lot of them have is the accession rate exceeds the cataloging rate. People are bringing in stuff faster than they can catalog it and organize it and that overwhelms a museum,” Irwin said. He’s also doing treatment work to repair damaged items and preserve particularly important ones, and each site has presented a new challenge in preserving different chapters of Alaska history. In Valdez, Irwin worked on the oldest American Legion charter in the United States. “It’s a very funny document because it says, ‘State of Alaska,’ and it was dated 1919. And it was signed by the U.S. members of Congress, so they were signing a document that wasn’t actually true (since Alaska didn’t become a state until 1959),” Irwin said. Irwin spent April in Petersburg at the Clausen Museum, where he worked on a logbook from a local mountain, Devil’s Thumb, which had been kept in a rusted metal can on the mountain for 65 years. Photo by Jenny Neyman, Redoubt Reporter. 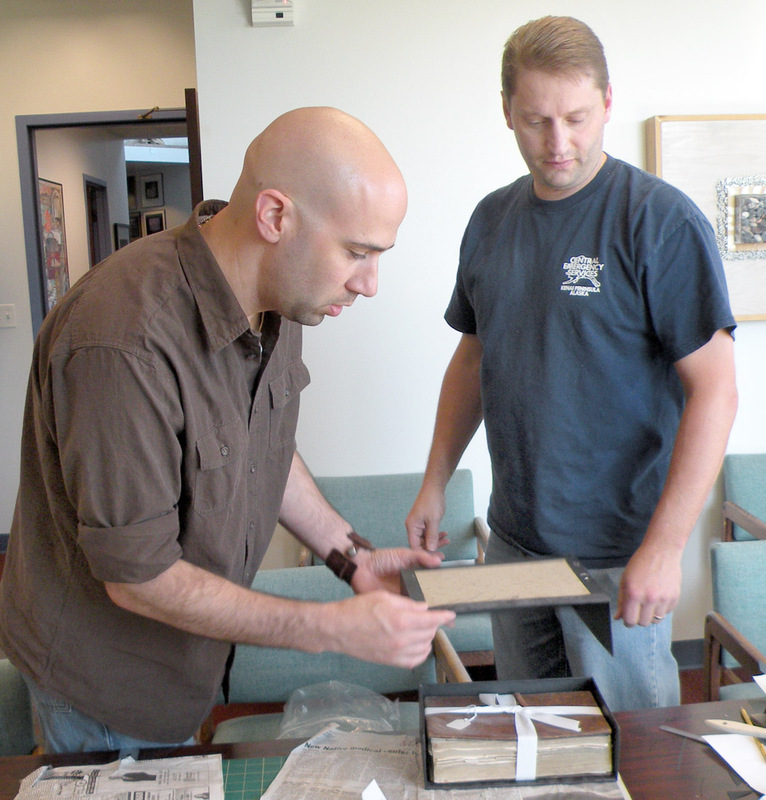 Paper conservator Seth Irwin helps Brian Erwin, of Frames and Things Gallery, construct a clamshell archival box for a historic journal found in the attic of the Russian Orthodox Church in Kenai. May was spent in Juneau working at the Alaska State Museum. He did restoration work on historic records from Eagle that were damaged in 2009 after an ice jam in the Yukon River gave way and flooded the town. He also worked to restore the original church registry of Holy Trinity Episcopal Church in Juneau, containing birth and death records from about 1885 to 1940, that was thought lost when the church burned down in 2006. In June, Irwin was at the Anchorage Museum, where he dealt with 26 large-scale panoramic survey photographs. “They were traditionally rolled up for storage because nobody has room for a 6-foot photograph, and so they were rolled up and they were left that way. You can’t just unroll it, it has to be relaxed over time. The problem is, until they’re unrolled, you don’t know what the content is, and you can’t just unroll them and look,” he said. July at the Aviation Heritage Museum presented Irwin with his largest challenge to date from the sheer volume of historic record. “The Aviation Heritage Museum has the largest photographic collection of anybody. They’ve got mountains of aerial reconnaissance maps going back to the beginning of Alaska aviation. They’ve got panoramic photographs going back to the late 19th century. When you have a photographic collection you have other problems that go along with it. A lot of early negatives were unstable and need refrigeration,” Irwin said. While the aviation museum has a wealth of historic documents, they aren’t worth much if they aren’t sorted, cataloged and properly stored. In August and September, Irwin was in Kenai working with the Kenai Visitors and Cultural Center, the Kasilof Historical Society and Holy Assumption of the Virgin Mary Russian Orthodox Church. “We dug 300 books out of the attic of the Russian Orthodox Church, 40 of which are dated to 1830,” Irwin said. He also worked to restore and preserve a framed calendar icon that held a bit of a surprise. “The church thought there was only one sheet, but there were 11 others behind it, because they never opened up the frame to realize there were 11 months behind the one month that was displayed,” he said. The visitors center, church and historical society used Irwin’s visit as a chance to not only learn how to care for their own collections, but to share his expertise with the community. The visitors center hosted a week of paper conservation workshops Sept. 6 to 11, free and open to the public, where participants brought in their own historic collections to ask Irwin about, and learned basic paper-handling and preservation techniques, “like tear repair, in my never-ending quest to eliminate the use of tape from museums,” Irwin said. Betty Idleman, president of the Kenai Historical Society, brought in her collection of 45 family diaries starting from 1870. Iron used in ink back then is particularly susceptible to the ravages of time. “Old writings that are brown, if you keep them out in the sun you’ll have lace because it eats the paper up,” Idleman said. Another common problem with old, leather-bound books is a phenomenon called red rot. “It’s due to early gas lamps in people’s houses, it created a situation called red rot in books which dries out the leather. Before electricity, the atmosphere in homes was very gaseous and acidic,” Irwin said. The leather dries out and starts flaking. Using products with water causes the leather to shrink, but there is a substance that can be brushed on and is absorbed into the leather, rehydrating it and preventing further flaking. “There’s so much we picked up that we can pass on,” Idleman said. Having open community workshops builds a base of knowledge that can be shared beyond just the workshop attendants, said Laura Forbes, director of programs and exhibits at the center. “The goal was to try to share the opportunity with as many people in the area as we could. I think there’s a lot of value beyond even the conservation piece, which is the opportunity to get to know people like Betty and Brian (Erwin, from Frames and Things Gallery in Soldotna) and other folks who had the chance to bring their collections in, because it creates opportunities for us to get together after this,” Forbes said. Irwin taught a two-day workshop Sept. 10 and 11 on making clamshell boxes, which provide archival-quality storage for sensitive paper items. Workshop participants — Erwin, Idleman, Forbes, Debbie Harris, art specialist with the Kenai Peninsula Borough School District, and Holly Cusack-McVeigh, curator of exhibits and anthropological collections at the Pratt Museum in Homer — made boxes that would be used to store the historic books from the attic of the Russian Orthodox Church. Erwin, a framer and owner of Frames and Things Gallery, said he and his staff often travel out of state to attend conservation and preservation classes, so he appreciated having an opportunity to learn new skills at home.“We can transfer some of this stuff into everyday framing. We’re here in order to not be in the framer’s box — there’s an idea, that’s how it’s always been done and it never changes. We just don’t approach anything that way. There’s always potentially a better way, a change that can potentially make it better,” Erwin said. After attending the workshops, Cusack-McVeigh is even more excited to have Irwin visit the Pratt Museum, a visit she’s hoping to arrange for January and February. Without a paper conservator in the state, and with only three object conservators who are plenty busy with their own work, much less fielding questions from curators around the state, Cusack-McVeigh said having Irwin here is invaluable. Like the visitors center, Cusack-McVeigh said she’s planning on not just keeping Irwin to herself at the Pratt. “If we get him he’ll be on several projects like this, historic documents, books, photographs, maps, but also doing public outreach as Laura and the cultural center has done here. We have lots of galleries and lots of artists and photographers in Homer, so we could do a series of collections care workshops for the public,” she said. Though Irwin’s tenure in the state is temporary, historic paper collections will still be here after he leaves. Cusack-McVeigh said this is an opportunity to train people to know how to preserve the past into the future. “That’s what’s cool about this group. You’ve got some people who are framers, artists and historians and conservators, and we’re all coming together. But what we’re discovering is we all have different little things about this we need to know, and we all work well together. So that’s been really neat to do this kind of public, open workshop. It’s a huge service to the entire peninsula,” she said.